The Float plane out of Homer was delayed 2 times and almost canceled because of the rain but then it cleared up and we were able to take off. I was very happy because this is the last day that they are going to Katmai National Park for their tours. 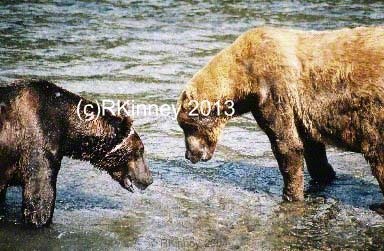 Katmai is the only known place where Grizzly bears actually gather to fish. We went to Brook Falls which is the place that you see on National Geographic with the bears standing on top of the falls with the salmon jumping into their mouth. We went on a 8 seater float plane. The two hour flight over alone was worth the price to go. The first thing that we did was go to a ranger talk where they told us all the do’s and don’ts of being there. After the training we got a Brooks Camp pin to show we had been through the training. The number one thing we learned in the training was that we had to leave all food and anything that had an odor to it, in a one locked storage shed. There was other storage for non food related items. They do have picnic table right there by the office and food storage place where you can sit out and eat but you can’t take anything not even a power bar out on the trails or to the falls. There are cabins available there for folks to stay over night but they looked pretty small and sparse. I headed down the trail to the falls. The first part of the trail went by a river where you could see all the salmon in the water. Eventually you enter into forest, which was a little erie. You are encouraged to walk with others but their wasn’t anyone around when I was there so I waited a little till some more people came. This was the part where the folks the night before had told me they had three bears charge by them. Once you get closer to the river, you go through a gate to a raised platform to walk on. It is about 10’ off the ground and you are not suppose to stop for any reason while on the platform because they say it disrupts the bears behavior. I didn’t see any bears until I got to the river viewing platform where there was a bigggg momma bear and two cubs and what looked to be a teen bear. 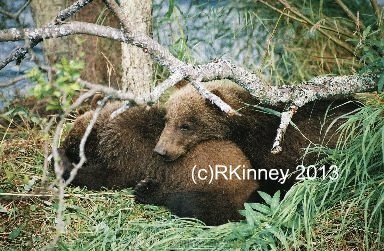 The cubs were so cute to watch play then their mom left them on the bank while she went fishing and they climbed a little ways up a tree trunk to watch her together, then came down and fell asleep on each other as they watched her. TOO CUTE! The size of momma bears claws were amazing. Momma bears fishing methods left a bit to be desired, since she seemed like she was trying to body slam the fish. She and the teenage bear, both seemed to kind of just do a sprawling dive for the fish. I didn’t see either one be successful. I walked further up to the Brook Falls viewing platform. It is a two tier platform that can hold about 10 people. Folks with their huge camera’s and tripods were here. This is where you see all the famous shots from of the fish jumping into the bears mouth. It was pretty cool. 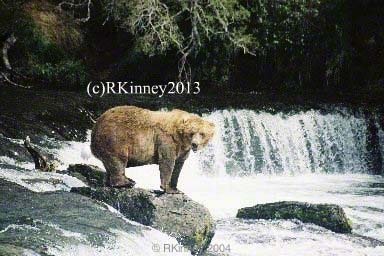 There were bears on top of the falls and below the falls and then a little further down the river as well. Some of the younger looking bears were on the outskirts. Two bears below the falls started growling at each other, one had a big gash on its head already. They had their mouths open and charged but one backed away. I thought it interesting that the bears on the top didn’t move too much to try and get a fish. One could jump right next to him and he wouldn’t even lean over to get it. Basically they just waited till one jumped right into them. A couple below the falls would sit there & then stick their head under the water for a while looking for fish, occasionally they would catch one. The sea gulls were also hanging out here and after a bear would get a fish and eat what they wanted, the sea gulls would move in. They sat near the bear and squawked away until the bear moved. When a huge bear came out on the top of the falls all the other bears above and below headed out of the water and back into the woods or at least further down the stream. He was massive and the 8 other bears took off, so I watched him a bit and then headed back to watch the cubs again. WOW!!! I have always wanted to go here!!!! Just amazing! One question - why is their last flight July 30? 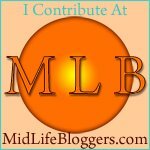 What's wrong with August? I thought there were more salmon then. The bears only gather there in the month of July. 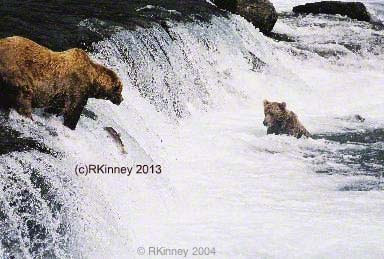 I am not sure what type of salmon run the river that Brook falls is on but that is when they run. 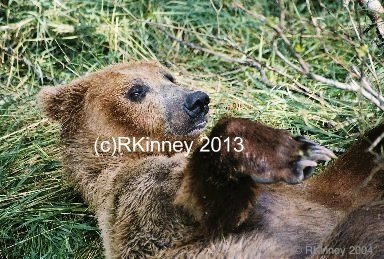 They still run tours to see bears after July but they have to go to another place to see them but they say it is more difficult to get too where the bears are. At Brook Falls the trails are established & the trail close to the river is all on a raised platform. 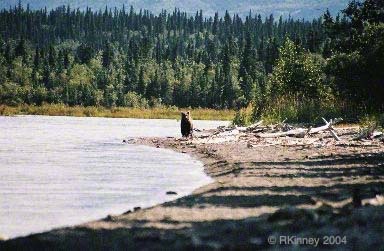 They say there can be 20+ bears there at one time, it was down to around 8 at the falls when I was there.